US one hundred dollar and Korean won currency with calculator. Finance business concept. The impeachment of the country’s president, Park Geun-hye, was met with resiliency by financial markets of South Korea. The KOSPI (Korea Composite Stock Price Index) actually rose 0.3% on March 10. It capped a weekly gain of 0.9% – the highest since mid-January. 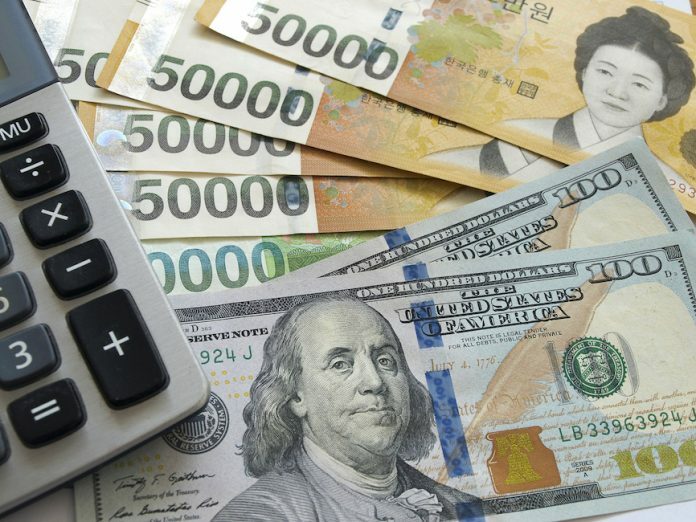 The Korean won also appreciated slightly against the US dollar (UUP) while the 10-year government bond yield remained unchanged from the previous day. The graph above shows the movement in the South Korean won vis-à-vis the US dollar. An upward movement means that the won is weakening against the greenback and vice-versa. 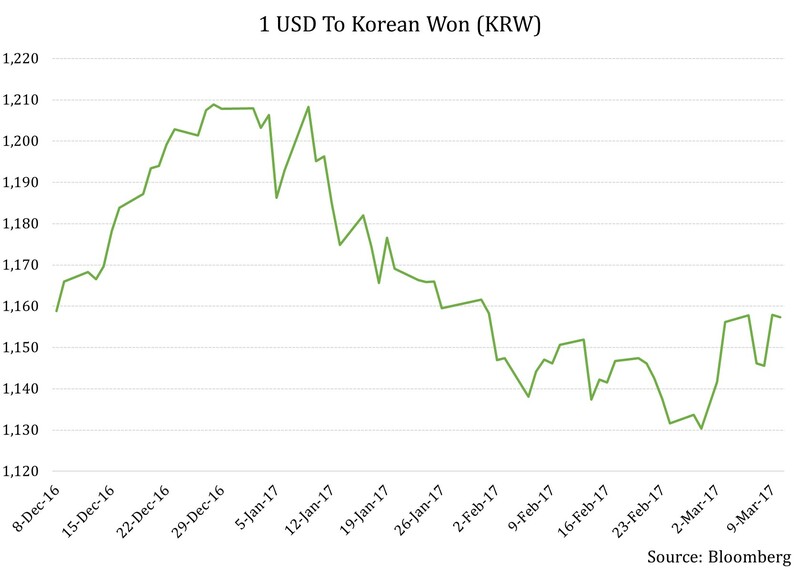 The won has strengthened against the US dollar in 2017 and even after declining in March, today it remains stronger than the days leading up to Park Geun-hye’s impeachment by the Korean parliament. Though the upholding of the impeachment by a Korean court may be a bit surprising for some, market reaction is not necessarily so. Very much like Brazil, where the impeachment of president Dilma Rousseff had led to cheer among domestic and foreign money managers, investors in South Korea have reacted the same way. The sharpness of the reaction is quite different, though in both cases, public opinion was noticeably in favor of impeachment. The primary reason driving the positive reaction from financial markets is hope that with a change in leadership, misuse of authority will cease and reforms will stand the nation in good stead. Foreign investors have been quite positive about South Korean stocks, having been net buyers for the entire trading week until March 10. In YTD 2016, foreign buyers have been net purchasers of equities from the country to the tune of 3.68 trillion won ($3.18 billion), according to Reuters data. While there are a few parallels between Brazil and South Korea as far as impeachment is concerned, there are important differences as well. First, the economic state of Brazil was extraordinarily poor last year. Hence, the news of impeachment and the perceived hope for the future was nearly the sole driver for financial assets. The underlying belief was that things can only get better from there. South Korea has its macroeconomic challenges, but is in a far superior state compared to Brazil. This means that when benchmarked against Brazil, the potential upside may be relatively small because until reforms are carried out, investors may not be as attracted to Korean stocks as they were to Brazilian ones. The impeachment of Park Geun-hye has been considered ‘unprecedented’ by many. This is proof that democratic process in the country remains strong and that people want politics to remain away from business. Any regulation or initiative disentangling the close relationship between politicians and business conglomerates, known as chaebols, would be taken positively by investors. 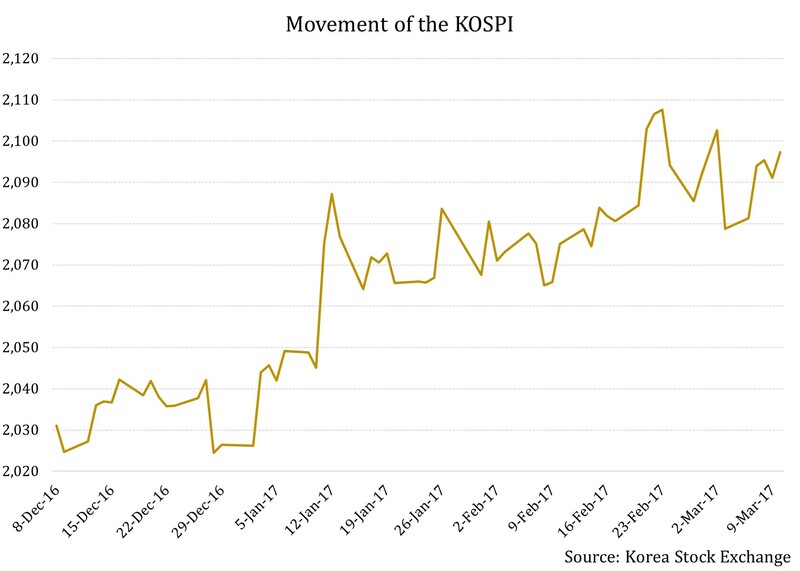 The KOSPI has remained strong in days leading up to impeachment by the Korean court, having returned 3.3% since a day before the impeachment vote by the Korean parliament in December 2016. Some market participants are hoping that with this political episode behind them, the new leadership can focus on addressing issues which are slowing the country’s economic growth. Though macroeconomic indicators do not drive financial markets directly, they point to the health of the nation which can either increase or dampen interest of investors. What equity investment avenues to look for? The iShares MSCI South Korea Capped ETF (EWY) has risen an impressive 7.9% in YTD 2017. Currency movement has been favorable to the fund as its currency-hedged version, the iShares Currency Hedged MSCI South Korea ETF (HEWY) has gained only 5.9% in the period. Other currency-hedged ETFs like the WisdomTree Korea Hedged Equity Fund (DXKW) and the Deutsche X-trackers MSCI South Korea Hedged Equity ETF (DBKO) have not fared as strongly, up just 2.5% and 4.5% respectively. The EWY has been led by stellar performance from the information technology sector, which is responsible for 60% of the fund’s YTD returns. Financials are a distant, though important second. 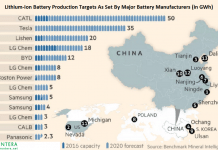 Even after being embroiled in controversy, Samsung Electronics has done well. The stock, which forms over a fifth of the EWY, has powered the tech sector. Meanwhile, KB Financial has led financials up. A look at the graph above will show you the performance of US-listed South Korean ADRs (American Depository Receipts). 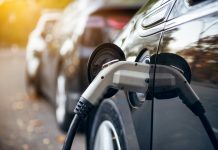 The four ADRs are that of KB Financial Group Inc. (KB), Korea Electric Power Corporation (KEP), POSCO (PKX), SK Telecom Co., Ltd. (SKM) – all from different industries. Except for KEP, all others have posted gains since a day before the parliament impeached Park Geun-hye until YTD 2017. 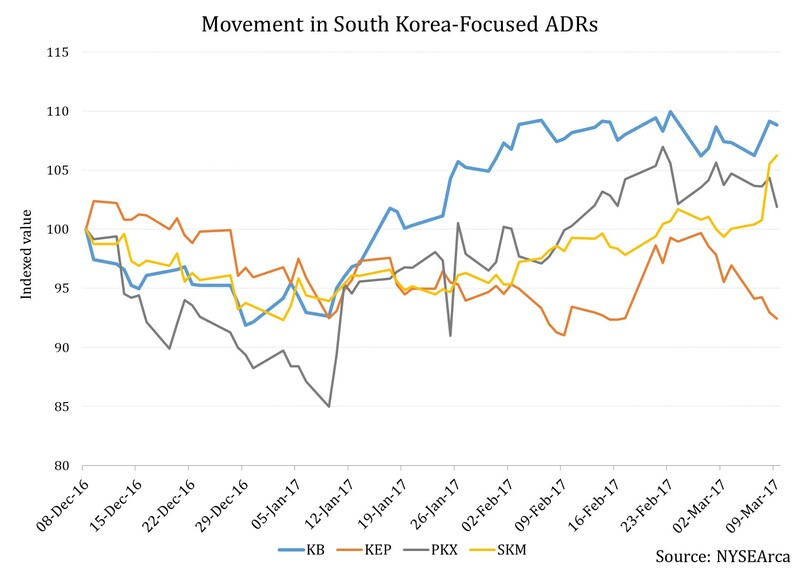 Thus, it seems that firm specific factors are at play when it comes to the performance of South Korean stocks, rather than the political turmoil that has gripped the country for the past three months. With the political situation having been partially resolved, South Korean equities may see some upside going forward in the short-term. 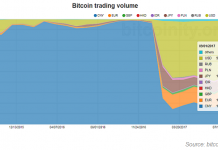 The elections, which need to be held in 60 days by law, will influence market movement. While keeping an eye out for polls, investors should also be aware of some macroeconomic and geopolitical situations that may arise in South Korea post the impeachment. Let’s look at them in the next article. Previous articleHow Much Longer Will a Weak Egyptian Pound Succeed in Luring Foreigners?